Happy Valentine’s Weekend! The weekend of too much chocolate (if there is such a thing), too much wine (there absolutely is such a thing), and not nearly enough football. We’ve taken what feels like a commonly evolved path of Valentine’s Day celebrations: back in the good ol’ DINK days it was flowers and fancy restaurants and spendy wine, then fancy dinners at home with an over-the-top chocolate dessert because WHY ARE THERE 3,000 PEOPLE TRYING TO EAT AT THIS ONE LITTLE RESTAURANT TONIGHT?! And that brings us to Valentine’s Day today and life with a 6 year old: it starts with a dessert-for-breakfast treat and ends with some pre-bedtime MarioKart. Landry requested chocolate pancakes for V-Day breakfast so when I opened this month’s HEB Primo Picks, I immediately went for the Texas Sheet Cake. Chocolate cake that was covered in frosting that was frosting in name only – it was more like fudge than anything else. And depending on the time of year, that “frosting” might also be studded with pecans. Pecans that we kids had just spent HOURS shelling because my mom knew to cash-in on that cheap child labor while she could. 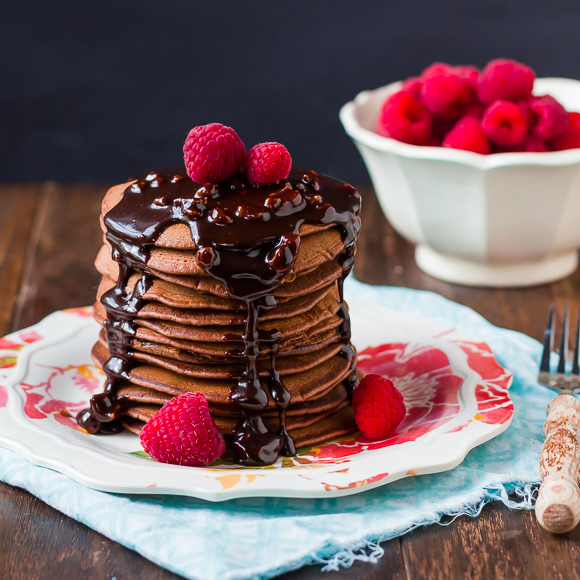 It’s a little tough to justify “cake in the big pan” with just 3 of us, so I turned that Texas Sheet Cake into Texas Sheet Cake pancakes for a chocolatey, Valentine’s dessert-for-breakfast treat for my sweets. The sweet chocolate cake batter is cooked on the griddle and then smothered in that good ol’ Texas Sheet Cake fudge frosting. 2. There is no step 2 – it’s that easy. HEB will randomly select two participants from the Instagram sweepstakes to win $100 H-E-B e-gift cards. 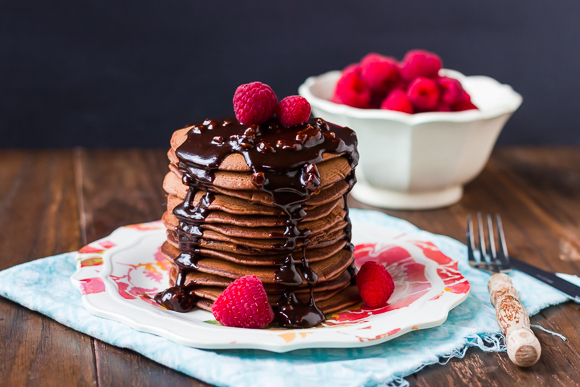 Texas Sheet Cake mix-turned-pancakes, topped with chocolate fudge frosting. *The cake mix comes with 4 labeled packets: cake mix and cocoa for the cake (which go into the pancake batter) and powdered sugar and cocoa for the frosting (which go into the frosting). Heat a nonstick griddle pan over medium-high heat. In a medium bowl, whisk together the dry ingredients: flour, cake mix packet, and the cake cocoa packet. Add the eggs, 1 3/4 cup milk, and oil and whisk until the batter is smooth. If you think the batter is too thick, add up to 1/4 cup more milk. Spoon batter onto the heated grill - I used ~3 Tbsp batter and ended up with 34 pancakes. When the bubbles have started to pop and the batter looses it's super wet glossy look, it's time to flip. While the pancakes are cooking, heat the butter over medium heat until it begins to brown. Add the frosting cocoa packet and 5 Tbsp water, whisking until smooth. Bring to a boil and whisk in the powdered sugar pack and turn off the heat. 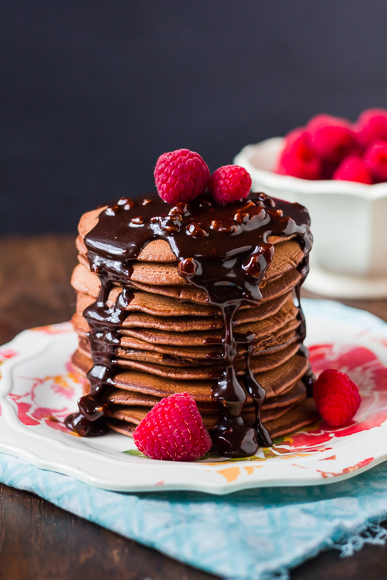 To serve, stack the pancakes a mile high, drown in still-warm fudge frosting, and drop a handful of raspberries over top. This recipe was developed in conjunction with H-E-B and I was provided ingredients as well as compensated for my time. Messy fingers, stretchy-waisted pants, and chocolate-smudged faces are all mine. You can find H-E-B on Facebook, Twitter, and Pinterest. And if you’re as lucky as we are, 3 locations within a 5 mile radius.